It's been awhile since I've started a show that both me and my wife want to binge from start to finish as fast as we can because we just can't get enough. The last one we felt that way about was Mad Men. Curious then that the newest show we chose, GLOW, had several MM alumni in it. Coincidence? Yeah, probably. What's it about? Well, it's a fictional account of how the very real Gorgeous Ladies of Wrestling show came to be. For me, this used to air on Saturdays in the 80s before Theatre Bizarre and other sci-fi/horror hosted shows came on and it was a treat. I was familiar with the WWF and enjoyed it, but GLOW was something else. It was colorful, it was wicked and it was fun. The Netflix series recreates that perfectly, but gives a wonderful backstory to the organization and wrestlers that make it up. 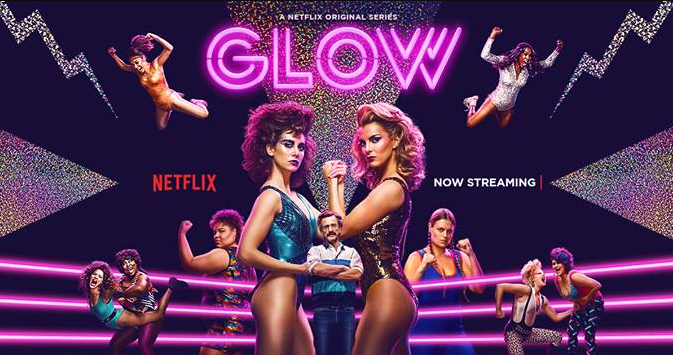 GLOW revolves around an ensemble of characters, but tends to focus on three: Alison Brie as Ruth, a struggling actor trying to make it; Betty Gilpin as Debbie, a former actor turned mother turned wrestler; and Marc Maron as Sam Sylvia, a sleazy movie director looking to complete a series as a launch pad to his next movie. These three have intertwining arcs, with Ruth and Debbie at odds with each other and Sam as the one trying to get them to work together. They're supported wonderfully with by the other women in the cast, who play colorful, damaged and unique individuals with their own histories that get delved into a little. Cherry (Sydelle Noel) and Carmen (Britney Young) get the most airtime in addition to the main three with great arcs that are heartbreaking and have you rooting for them to come out on top. Hopefully we'll get more time with the other members of the gang in the future. I just finished it up last night and I have to say that it was just about perfect. If it is only one season, I'll be terribly disappointed but it wraps up on such a note that even if it doesn't get a second order, we can be happy with how everything turned out. I really want to see another season, though. I need more of Zoya the Destroya in my life.